Hem hem! In some ways the High Inquisitor of Hogwarts makes a better villain than Voldemort, because we’ve all known revolting bureaucrats just like her. Under the political scheming, brainwashing campaigns, and artificial sweetness—which are bad enough—she proves willing to harm the children under her care. Every time I read the book, I hope she’ll choke on one of her fussy china cups of tainted tea. This heartless fire-and-brimstone preacher thinks he can bend another culture to his will. Determine to convert a Congo village, he risks his children’s lives in a period of civil unrest rather than abandon his self-imposed religious mission. Local people refuse his attempts at river baptism for fear of crocodiles; if only one of the grinning reptiles had gotten hold of Nathan instead! This vicious socialite should’ve fallen off her yacht on that fateful European cruise, before her slanderous accusations caused heroine Lily Bart’s tragic downward spiral. Anyone who thinks mean girls are a contemporary phenomenon has never read the “novel of manners” genre. I read this YA historical novel about the Lowell Mills many years ago, and hated this character so much I still remember him acutely enough to include him on this list. A lecherous man who sexually abuses the young girls in his factory deserves way worse than a lungful of water. Melisandre…Ramsay Bolton…Cersei and Joffrey Lannister…it would be quicker to list the characters in this series I wouldn’t want to drown. All are complex and engaging, to be sure, but horrible people. Thankfully author Martin has proved perversely creative in his character demises; I look forward to seeing these wretches get their comeuppance, if he ever finishes the next book! 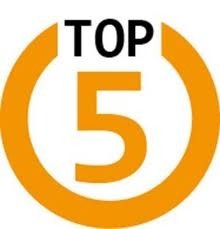 Check out the Goodreads group for Top 5 Wednesday to join in the fun with other “Wednesday-ers“! “The Martian” becomes a movie! What a great topic for your first T5W! I’m writing my list now, and I’m struggling to narrow it down to 5 – I’m not evil, I promise! I read The Poisonwood Bible ages ago… but I totally agree. What a horrible man!